offers a convincing balance between transistor and op-amp characteristics. 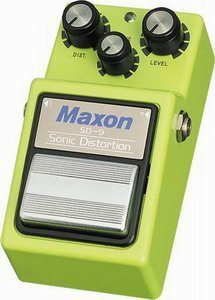 The black sheep of Maxon’s 9-Series, the Sonic Distortion offers a convincing balance between transistor and op-amp characteristics. The unique Low Boost/Hi Boost tone control offers plenty of beef while the output and distortion knobs dish out up to 55dB of vicious gain boost. At low-gain settings, the SD-9 functions perfectly as a full-frequency overdrive. Crank the gain and get gut-wrenching grind and singing sustain that’ll turn a clean amp dirty and a dirty amp downright evil. Features true bypass, die-cast zinc case, and 3-year warranty. Works like an additional preamp for your amplifier. Works like an additional preamp for your amplifier. Combine with various drive settings on your amp for powerful tone shaping. Hand-selected 12AX7WXT preamp tube. 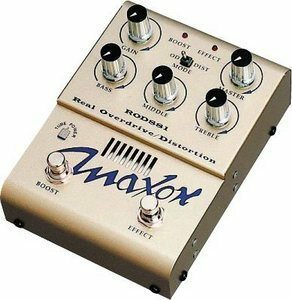 Switchable distortion mode adds a secondary gain stage for extreme distortion. Gain and master volume controls provide a wide variety of overdrive tones, from clean boost all the way to searing, saturated sag. Bass, treble, and mid boost controls with extended operation ranges offer a limitless array of tonal options, from the classic “808” tone to beefy, low-end chunk. Noise-free tone via rear-mounted, switchable noise reduction circuitry with variable threshold control and a 1:2 noise reduction ratio. Powered via a standard 9-volt DC adapter, allowing easy integration into your pedalboard or rack setup. 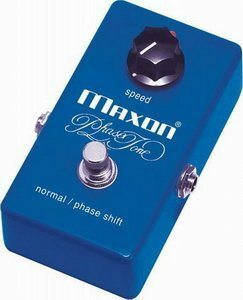 it can be a very powerful tone shaping tool. The first offering in the Real Tube Series is the ROD880 Real Overdrive. The ROD880 is just that – a real tube overdrive unit that will warmth and incredible sustain to any guitar rig. The ROD880 works very much like and additional preamp for your amplifier, and when combined with various Drive settings on your amplifier it can be a very powerful tone shaping tool. Powered by one hand-selected 12AX7WXT preamp tube, the ROD880’s Gain and Master Volume controls provide a wide variety of overdrive tones, from clean boost all the way to searing, saturated sag. Bass, Treble, and Mid Boost controls with extended operation ranges offer a limitless array of tonal options, from the classic “808” tone to beefy, low end chunk. All of the ROD880’s sounds are kept clean and noise-free via the rear mounted, switchable noise-free tone via rear-mounted, switchable noise reduction circuitry with variable threshold control and a 1:2 noise reduction ratio. Powered via a standard 9-volt DC adapter, allowing easy integration into your pedalboard or rack setup. for everything from a subtle pinch to extreme squash. 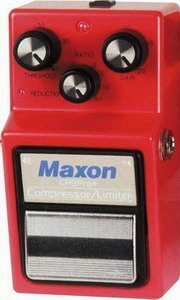 Many of the greatest recordings of all time were tracked using tube compressors. The RCP660 gives it to you with controls that are incredibly simple to use. There’s a master volume plus sensitivity control that determines when the compression is activated. Attack and sustain knobs control the degree of compression and intensity, allowing for everything from a subtle pinch to extreme squash. Footswitchable boost function allows for quick changes between solo and rhythm playing, or the ability to use it as a clean booster in front of your amp. Powered by one hand-selected 12AX7WXT, it can be used for guitar or bass due to its transparent operation. a classic sonic palette that has defined the tones of guitarists for the past three decades. An ideal phaser for any kind of instrument or application — incredibly smooth and transparent — enhancing an instrument’s character rather than masking it. 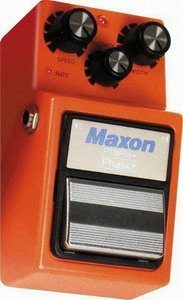 Faithful reproductions of the legendary 1970s product line, the Maxon Reissue Series Effects offer today’s musician a classic sonic palette that has defined the tones of guitarists for the past three decades. Each model’s circuit is 100% analog and packaged in a time-tested chassis for a lifetime of trouble-free performance. Component quality and PC board layout have been optimized to provide consistent, low noise performance without adding unnecessary coloration to your instrument’s tone. The entire gamut of classic phasing and rotary speaker effects in one pedal. 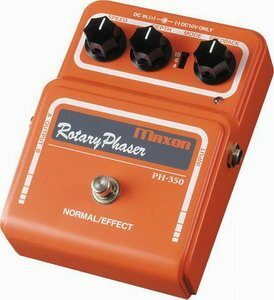 The entire gamut of classic phasing and rotary speaker effects in one pedal. Switchable 4-, six-, or ten-stage phase shifting with rate and depth controls for precise sweep command. Feedback control with detent for positive or negative feedback. True stereo outputs for panning of the effect between 2 amps or channels. added unique voltage-doubling circuitry for greater headroom. 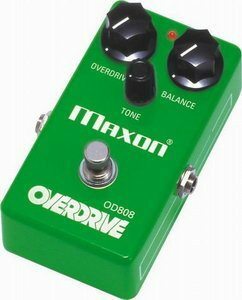 Improving on their own standard-setting OD808, Maxon has added unique voltage-doubling circuitry for greater headroom. 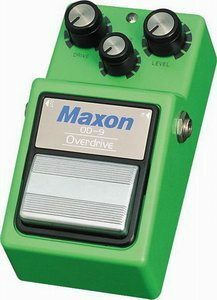 It’s the smoothest, warmest, most transparent overdrive ever. Reacts precisely to every picking nuance and playing dynamic. Features true bypass switching. 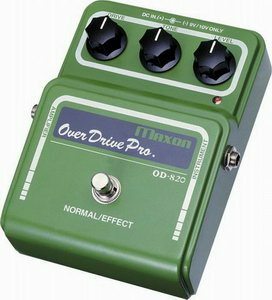 Drive, tone, and level knobs for precision tone control. Uses 9-volt battery or included AC adapter. offers smooth, natural overdrive similar to a full-up tube amplifier. Identical to the original circuit and featuring the JRC4558 IC chip, the OD808 Reissue offers smooth, natural overdrive similar to a full-up tube amplifier. Incredibly transparent, the OD808 responds to dynamics and every nuance of your individual style. It also lets the true tone of your instrument shine through. a new chip yields the ultra-smooth dynamic overdrive guitarists crave. The OD-9 may look like your old favorite but that’s where the similarity ends. Improved circuitry with a new chip yields the ultra-smooth dynamic overdrive guitarists crave. Drive and Level controls tweak the intensity and volume while the Hi Boost/Hi Cut tone controls adjust brightness. Features true bypass switching, a die-cast zinc case, and 3-year warranty. From subtle cries to shattering screams, the OD-9 delivers a huge range of tones. Ideal for use with any instrument, including bass! maximum head room with ultralow noise operation. Its wide frequency range makes it suitable for use with a variety of instruments. 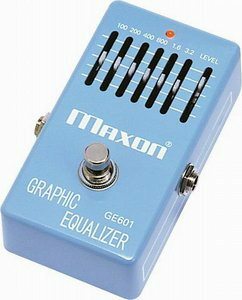 Covering six carefully selected frequency bands from 100Hz to 3.2kHz and offering +/-12dB of cut or boost, the GE601 can be used as a tone filter, feedback eliminator, pickup simulator, or level booster. Its wide frequency range makes it suitable for use with a variety of instruments. Pickup Simulator (humbucker to single coil) By cutting 200 Hz, 400 Hz, and 800 Hz and then boosting 100 Hz and 1.6 KHz, the GE601 allows a humbucker to simulate the sharp sound of a single coil. Pickup Simulator (passive Bass to active Bass) By cutting 200 Hz and slightly boosting 100 Hz and 1.6 KHz, the GE601 can give a passive Bass the clarity and punch of an active instrument. Pickup Simulator (single coil to piezo) By cutting 200 Hz, 400 Hz, and 800 Hz and boosting 100 Hz, 1.6 KHz and 3.2 KHz, the GE601 allows a single coil electric to simulate the bright, chiming sound of an acoustic guitar with piezo pickup.